We can cut it down to any size and shape. You know exactly what you want when you send out a plate-burning-job. Number one is quick turnaround along with pickup, delivery, and competitive pricing. All three considerations are equally important for you. That makes Fulton and South Side your best choice for plate burning contract work. 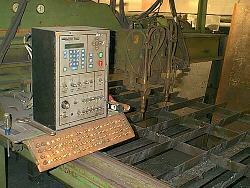 Our CNC burning machine has 50 pre-programmed shapes, only requiring your job's dimensions before completing. 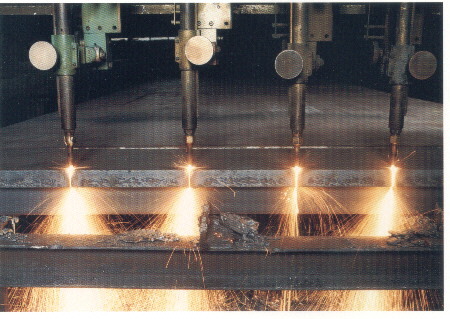 With our cutting machine's four torch-cutting heads, we can cut multiple pieces at a time. 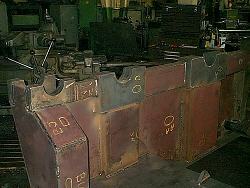 Our software can interface with your computerized drawings to cut any shape we don't have programmed. 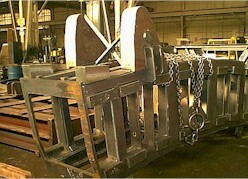 We can also make a drawing from your sketches or from a sample part. Shape sizes can be up to 8' X 20' X 6" thick. 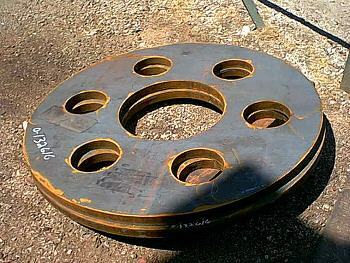 Fulton and South Side stocks a wide range of plate thickness and chemistries. In ASTM A-36 we have 1/4" through 6". In many instances, we can save you THE time and the trouble of ordering the plate yourself. Fulton and South Side purchases large quantities of steel, added to our attractive labor rates and chances are your plate burning job will be less costly with us. Even with the smallest job there is no compromise in Fulton's and South Side's over 100 year-old reputation for quality control. 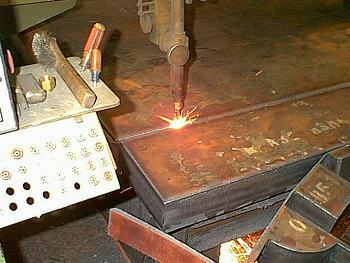 Whether it is torch burning, steel quality, or anything else, our highest standards apply. Picture of our Burny computerized burning table. We have a large selection of preprogrammed burnout's plus AutoCadLT to draw special shapes, save to file, and burnout on our table. 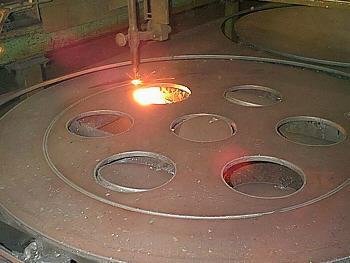 We have the capability to burn up to 6" thick, with 4 operational torch heads and up too 12" thick with one. Call us for your special burnout needs. 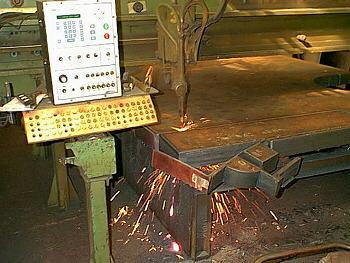 The plate being cut below is 4" thick. All the pieces on this winch base were burned out on the Burny, assembled, finished welded, stress relieved, and finish machined. Caster segment frame burned out on the Burny, assembled, finish welded, stress relieved, and finished machined. Gear webbing was burned on the Burny, assembled to an inner and outer forging, welded, stress relieved, finished machined, and shaped. Gear webbing on burnout table. Gear webbing ready for assembly.